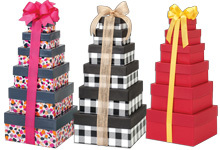 Convenient gift and gourmet boxes with hinged window lid & attached ribbon for beautiful bows! Basket Boxes for Birthday, Get Well, Baby, Valentines Day, Halloween, & more! 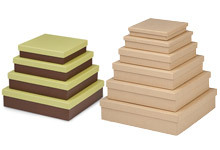 Slideout macaron cookie boxes in stunning colors! 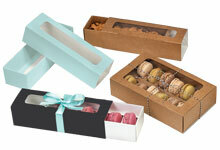 Gourmet and gift boxes with lids are available in 4 sizes and many colors! 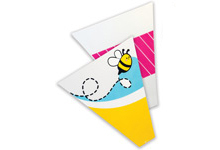 Unique candy boxes with an easy to use popup design and attached ribbon make packaging quick and easy! 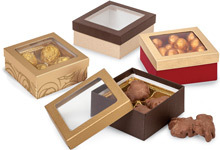 Attractive truffle boxes with lids are made of sturdy cardboard. Now On Sale! 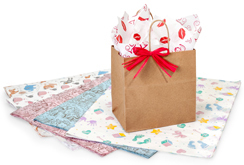 Tissue paper for gift bags in baby and Valentines Day prints! Ultra clear printed cello wrap in several special occasion designs. 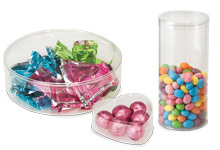 Clear Display Boxes available in a wide variety of shapes and sizes. 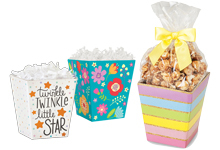 Small gift basket or favor boxes in a wide variety of designs and solid colors. Now On Sale! Premium three piece sets of nested boxes in two size combinations. 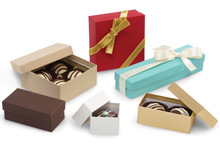 Elegant rigid candy boxes with a clear window lid. Now On Sale! Premium paper gift bags are available with gold polka dots, hearts & mustache designs. 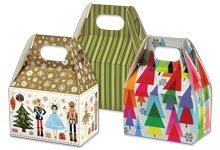 Mini Solid and Printed Gable Boxes with pop up design in packs of six. Now On Sale! Two Piece Nested Gourmet Boxes in Christmas and everyday designs. Sturdy heart shaped candy boxes in beautiful colors! Special Occasion Gift Cards with coordinating themed basket boxes. 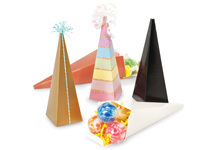 Unique cone shaped favor boxes are great for parties! 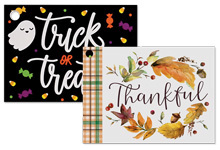 Closeout Pricing! 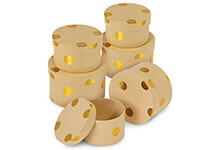 Sturdy Brown Kraft Round and Heart Shaped Boxes with metallic dots. 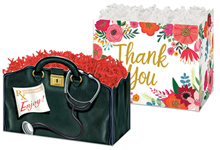 Make sharing the love easy with Valentine's Day gift bags, heart boxes, gorgeous ribbons, jewelry packaging, floral bouquet sleeves and more. 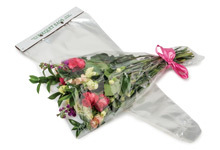 Nashville Wraps has the sweetest Valentine packaging for candy, flowers & gifts! 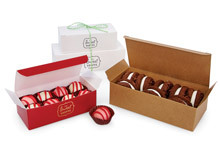 Heart shaped candy boxes is definitely the top favorite way to show your love in the packaging category! Our heart boxes are extra special because they have slots to secure your own beautiful ribbon. 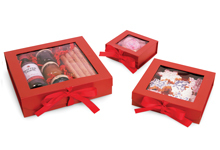 Customers love our gourmet boxes with clear windows and attached ribbon for easy tying. 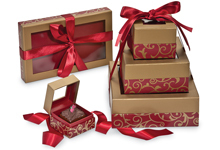 We have great options like presentation boxes to make your Valentine treats extra impressive. From favor boxes for truffles to bakery boxes for cupcakes, you can find every type of box for gourmet food packaging at Nashville Wraps! See another Valentine favorite, see our entire line of wine & bottle packaging . 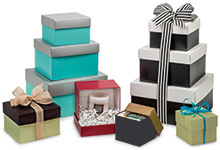 Package your jewelry in top quality, American made jewelry gift boxes. 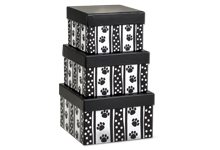 Filled with non-tarnishing white eco fill, you will find dozens of sizes and styles in these sturdy rigid boxes. Creating sweet Valentine gift baskets is easy and fun using our basket boxes, market trays & sweet treat boxes . 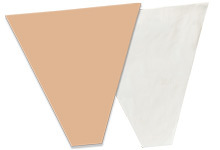 Add in colorful shred to support your product. 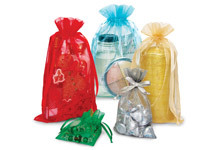 Wrap your basket up with cello basket bags or Valentine cello rolls. Find all the gift basket supplies you need for creating the perfect baskets. Flowers are the perfect way to send your love. Wrapping them in pretty floral wraps and sleeves protects them along with enhancing their beauty. For larger gifts, we recommend our using our Valentine gift bags . Smaller gifts look super cute in any of our fabric bags made from organza, cotton, linen or burlap. When wrapping Valentine food products like candies and cookies, select heart-themed Valentine cello bags. Finally, for wrapped gifts you can find Valentine gift wrap in heart designs. 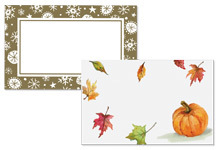 Remember to stock up on gift & apparel boxes s along with tissue paper. For the perfect finishing touch, select a fun Valentine ribbon ! Nashville Wraps has adorable Valentine packaging for your gift & gourmet business. We hope Valentine's Day is full of love & sweetness for you and your customers! 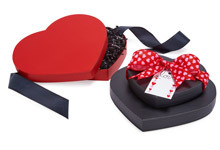 Heart-shaped candy boxes is the top favorite way to show your love! Our heart boxes are extra special because they have slots to secure your own beautiful ribbon. 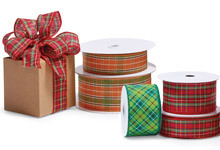 Customers love our gourmet boxes with clear windows and attached ribbon for easy tying. We have great options like presentation boxes and folding presentation candy boxes to make your Valentine treats extra impressive. From favor boxes for truffles to bakery boxes for cupcakes, you can find every type of box for gourmet foods at Nashville Wraps! 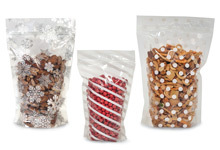 See our entire line of candy & gourmet packaging . Package your jewelry in top quality, American made jewelry gift boxes . 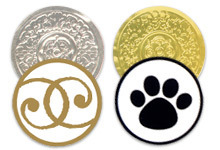 Filled with non-tarnishing white eco fill, you can browse from dozens of sizes and styles. like and folding presentation candy boxes to make your Valentine treats extra impressive. Creating sweet Valentine gift baskets is easy and fun using our basket boxes, market trays & sweet treat boxes . Add in colorful shred to support your product. 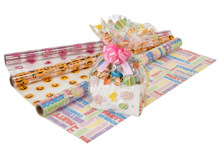 Wrap your basket up with cello basket bags or Valentine cello rolls . 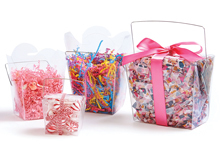 Find all the gift basket supplies you need for creating the perfect baskets. 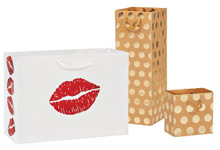 For larger gifts, we recommend our using our Valentine gift bags . Smaller gift look super cute in any of our fabric bags made from organza, cotton, linen or burlap. 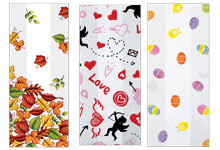 When wrapping Valentine food products like candies and cookies, select heart-themed Valentine cello bags . 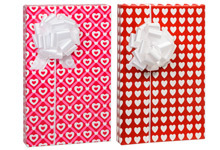 Finally, for wrapped gifts you can find Valentine gift wrap in heart designs. 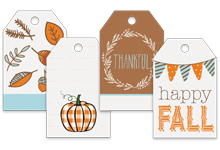 Remember to stock up on gift & apparel boxes along with tissue paper. 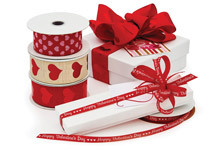 For the perfect finishing touch, select a fun Valentine ribbon!